The AIM NetworkNews and PoliticsWhy “It’s Time” worked. Why Voter caution is required. Why “It’s Time” worked. Why Voter caution is required. Way, way back in ‘72, Gough Whitlam won government from a tired Coalition that had simply run out of puff. The Leadership was in chaos, they were pretty much out of ideas, they had no idea or desire of how to extract us from the looming defeat in Vietnam, party leaders were compromise candidates rather than strong leaders. Basically they were ripe for the picking even though Labor had not been in power since one Election beyond WW2. Along came Whitlam. A man with charisma, more ideas than he could possibly achieve in a single term of Government, an easy humour, a sharp wit, and the strength to control his party (a rare skill). He was facing an opponent who’s main claim to fame was (and this is true) a missus with the best set of legs in Aussie Government history. Lady McMahon’s visit to the White House in the days on Nixon scandalised Conservatives in both countries. 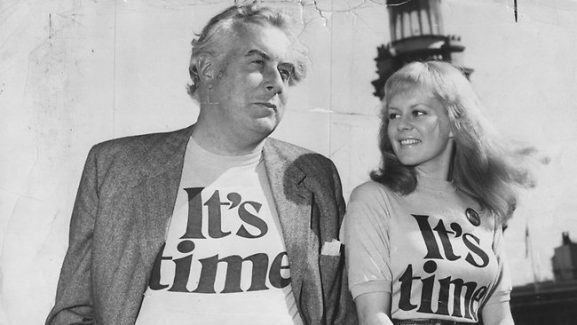 A serious part of the success of Gough was the It’s Time advertising campaign. Having already established himself as a Statesman with a visit to China, which Nixon did the following year, and showing himself prepared to get us out of Vietnam, he had the popular support, ideas, and now the advertising campaign to get the job done. He was the front runner in the polls and delivered on polling day, breaking Labor’s 23 year drought. But here is the catch with this style of campaign. You have to back up that slogan with either ideas, or a blanket advertising campaign that’s heavy on fluff, and light on policies. If you don’t present yourself as the alternative Government, then you look like the spoilt brat that demands his turn and that is a place you want to avoid at all costs. And that seems to be where the South Australian Opposition is at the moment. Looking from outside the State, it seems that Jay Weatherill is the most dynamic of the potential leaders and he doesn’t take a backward step when it comes to dealing with Canberra. Who can forget him cleaning Josh Frydenberg’s clock over energy matters? Usually State pollies let the Feds take all the credit when they have actually been the biggest obstacle but Weatherill crashed the PR session and took no prisoners giving him both barrels. Now whenever we see Josh we can’t help remembering the most popular video clip for that year. Type Weatherill in YouTube and the first suggestion it offers is a search with Josh. While we are on the topic of It’s Time, I can’t let Nick Xenophon (SA Best) off the hook with his bizarre attempt to re-enact Gough’s advertising campaign. It looks like a cross between It’s Time, Con the Fruiterer, and an Indian Musical. Check it out here. Usually Senator X is that brand of pollie that loves the camera, loves to talk a big game, but in the end as soon as the photo op has been secured, he rolls over. The quality of Adelaide water has always suffered from States higher up the Murray River taking what they want and leaving South Oz with whatever they can’t use themselves. When negotiations were underway Nick made a big song and dance about blocking the Bill in the Senate. Then he entered negotiations and earned the promise that the Feds MIGHT look into the scheme in a few years time to see if it was working. That doesn’t sound like the sort of chap I would want to stick up for me. Looking at the polls for next Saturday it looks like Nick might not score any seats, but his preferences might aid the Liberal party he once lived in and regularly voted with in the Senate. It will be sad for South Australia if they move away from a dynamic Leader to someone who believes it’s his turn and is propped up by a self promoter rather than one who looks out for South Oz. This article was originally published on 1PETERMCC’S Blog. It’s certainly time, but who the hell can we trust? Neither camp has much to offer, or do they? I, & I believe thousands of the voters here in SA, all hope like hell that the lying, incompetent so-called “labor” leader & his party are NOT reelected next week! The Labor mob are responsible for SA citizens paying the highest power & water rates in the world, they have sold off everything they once controlled–& Weathercock says “I will not privatise anything” if elected, trouble is there is nothing or almost nothing left to be privatised!–he has “wasted” taxpayers money on “schemes” we DO NOT “need”, he has the world’s most expensive (or close to it!) new RAH Hospital, which is going to cost us all over a million dollars a day for over 30 years, & that is just to pay for the building!, he has presided over a huge Old age care facility disaster, has constantly lied to protect members of his party & Public servants from any blame etc they were responsible for, & the list just goes on! There are many more reasons why he & his incompetent mob should not be reelected, but knowing just how many “rusted on” Labor voters there are in SA, I seriously doubt if he will lose! Bugger! News just in that the Liberals in SA have been found guilty of false advertising during the election campaign by claiming that they will improve South Australian’s power bills by a decrease of $300 a year as a result of their energy plan. Unfortunately for them, most of the decrease – some $230 of that – will happen regardless of their plan due to the renewable energies put into place by the current state Labor government. Even the remaining $70 can’t be proven. The Liberals intend to go along with the Fed’s non existent energy policy which would see SA having to dismantle a large portion of what has already been built in terms of renewable energy. As Premier Weatherill said, this is just the beginning. SA has been identified by some major overseas investors as the place where there is a commitment to renewable energy and have plans to build batteries, along with a list of other technologies based on same. The Liberals don’t think we should stand up to the other states or the Feds over changing the line re the Murray Darling plan after the theft of water and corruption already enacted and done nothing about. The river is dying at its end for crying out loud. Weatherill has instituted a Royal commission on the theft of water and mismanagement of commonwealth funds as per the agreed plan. If the Liberals are elected in SA it will be like watching a repeat of the Federal Liberal’s comedy capers. Do nothing except for the wealthy mates and to curry favour from Murdoch and his hench journalists. The Liberals in SA think the deregulation of shopping hours, the winding back of renewable energy and reduction in payroll tax is going to do it for SA. Their policies are not only ‘old think’, they’re devoid of detail like their Federal cousins.They also like to pretend by implication that Weatherill has been in power for 16 years when he has only been premier for one full term. God help us all if Steve Marshall’s mob who use him as a glove puppet by the way, and that narcissist idiot Nick Xenophon, slide into government here. SA Best preferences just as a matter of interest are running a predicted 60% to Labor. I presume you think someone is offering something better? And just because Marshall says something doesn’t make it true. South Australia has the highest retail electricity prices in Australia – but not in the world – and they have very little to do with state government decisions. And it was the Olsen Liberal government with the aid of Xenophon and two Labor splitters who privatised the electricity grid. Whitlam was the only truly Labor Prime Minister I have ever seen in my lifetime, the conservative forces in Australia couldn’t handle his ‘people’ policies. He put ‘people’ first before profit he truly wanted to help ‘people’ and the tories couldn’t stand it. They crucified him in the Murdoch media especially, blew any mistake he made into a huge ‘affair’ and hounded him until they found a way of ridding wealthy Australians of his ‘people’ policies. There has never been another truly Labor Prime Minister in my lifetime. I hope Labor wins. I believe the premier has taken action that will see cheaper, reliable power in the near future. Would hate to see his efforts undermined as we see in the federal govt. NDIS, NBN Medicare etc. It does seem that the Greens will act against the ALP, leaving us with the coalition in power. How can they act in a way which has their main ‘enemy’ elected rather than a party which is more aligned with their fundamental policies. I have never trusted Xenophon, I’m disappointed in the Greens, Liberals are out of question for me, so I sincerely hope that Labor, and the intelligent Premier, Weatherill, will win…. As a South Aussie I hope the ALP wins (with the Greens holding BoP) otherwise the people of SA will be treated with the same contempt Will Hodgman has treated Tasmanians, for their incredible naivety. You may say Labor does this too, but I can’t believe they are as bad as the alternative. Here’s hoping Team X does not tip the Libs over the finishing line. If so, then South Australians can say goodbye to a burgeoning renewables industry in which energy prices would eventually come down. As for water, as should be bloody obvious just looking at a map, South Australia foes not get much of a say in what foetid trickles remain after the (so-called) National party has finished scratching the hairy backs of their mates. Now that’s a really good question. Why should voters exercise caution? If it is in respect of state issues, there are the obvious ones. Like gambling, which worked really well for Tasmania. The AHA was successful in making it the biggest issue to cost thousands of jobs and Labor got sucker punched, only to find there was one of those ‘back room deals’. How does that play out in SA? Well, SA Best changed their policy in February from one of removal to one of reduction. Naturally, this hasn’t stopped the AHA from absurd claims about tens of thousands of jobs being in jeopardy. At least Labor haven’t been sucker punched this time. SA Best may struggle. As for the energy issues, remember Labor didn’t just do the battery thing, they also introduced combination policies combining power with housing. Well, that is one of those ‘hybrid’ issues where state policy and national policy overlap. A bit like defence. Does anyone know exactly where we are with the submarine thing? Surely Pyne would know by now how many jobs are on offer from DCNS in SA, wouldn’t he? My bad. DCNS changed its name in June, 2017. Changing its name had nothing to do with the enquiries in at least three countries about widespread corruption. Australia hasn’t launched theirs yet but that seems to be a matter of ‘when’, not ‘if’. Ah well, we don’t know how much of the $50bill will be spent in SA. Another of those weird hybrid questions that seems to be overlooked. Exactly why did the Productivity Commission’s GST review get delayed until after the Tasmanian and SA elections? Guess we’ll never know. Nup, no corruption in Oz politics. SA goes to the polls this weekend and the issue is ……..? Why would voters need to be cautious? Thank you helvityni. Michael has left the pics I used on my blog. Premier Jay has done a mighty job with the batteries and his plan to install $50,000 solar arrays on publicly owned housing is also a winner, however if the Liberals get in with the help of tricky Nicky the South Aussie people will regret it no end. With Turnbull’s extremist right wing govt in Canberra and a tory govt in SA there would be collateral damage a plenty.Please SAians don’t vote SABest/LNP they are one in the same, just different ticketing.